Interview: At the time of interview the candidates are expected to discuss their research interest/ area, choice of supervisors/co-supervisor and proposed title of thesis. School of Engg. & Tech. : Under graduate course in respective discipline. School of Physical Sciences: Post graduate course work in respective discipline. School of Life Sciences : Post graduate course work in respective discipline. School of Management : Post graduate course work in respective discipline. 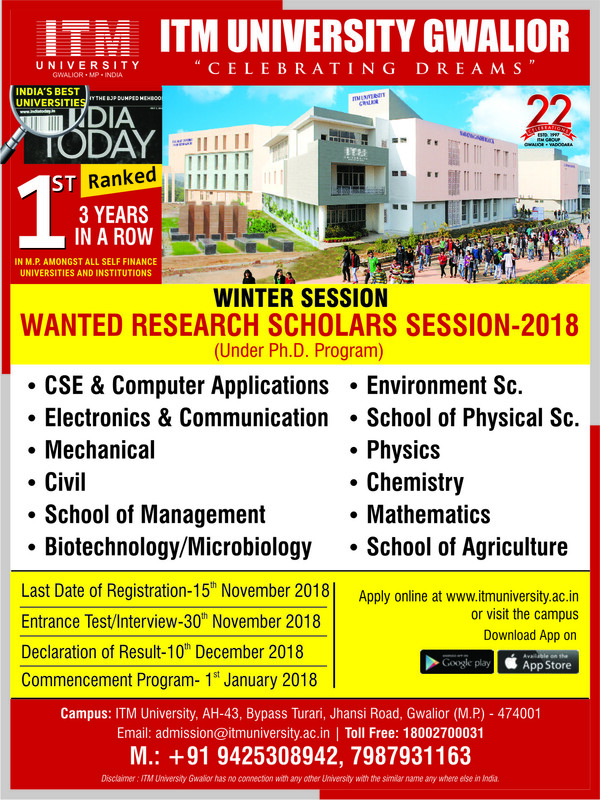 School of Computer Application: Post graduate course work in respective discipline or equivalent. The candidate is expected to make presentation on the research work he /she propose to pursue. The experts may ask any question on his presentation and the syllabus, prescribed for entrance test. Weightage is 20% for interview, 60% for written test & 20% of aggregate or qualifying P.G. examination. 2.0 candidate must apply for registration for Ph.D degree of his subject on a prescribed form obtainable on payment of prescribed fee, stating. Proposed title of the Ph.D. thesis. Name of the supervisor (along with the name of Co-Supervisors, if any) (Strictly from the University list of approved Supervisors & Co-supervisors) under whom he/she wishes to work and the place/places at which he/she wishes to carry on investigations together with the consent of the Supervisor and Co-supervisors. Letter granting teacher fellowship, if any. Address, Contact number, mobile number, email id and other contact details. A Professor in a University Teaching Department of the University who has obtained a doctorate degree in the subject and has published at least seven research papers on the concerned subject in peer reviewed standard journals of repute. An Associate Professor or Reader in a University Teaching Department of the University who has obtained a doctorate degree in the subject and has published at least seven research papers on the concerned subject in peer reviewed standard journals of repute. An Assistant Professor or lecturer of a University Teaching Department who has obtained a doctorate degree in the subject and has published at least seven research papers on the concerned subject in peer reviewed standard journals of repute and has at least five years teaching experience after Ph.D.
A Director/scientist/professor/or an equivalent cadre in an organization of National/International repute not below the rank of an Associate professor of the University, working as regular employee and who has published at least seven papers in peer reviewed standard journals of repute. (b) A recognized supervisor who fails to publish at least two research papers on the concerned subject in peer reviewed standard journals of repute over duration of last two years shall not be eligible to enroll any new candidate under his supervision. Provided that the persons who have been recognized as supervisor/co-supervisor shall be eligible to supervise and register under him/her even after their superannuation. Provided also that the teacher in any college, which is now a constituent unit of this University and who has been recognized as supervisor/co-supervisor earlier by the concerned University, shall continue to be recognized as supervisor/co-supervisor if they comply the requirement laid down for recognition as supervisor/co-supervisor. Provided further that a person who is himself registered for Ph.D. degree of the University shall not be eligible to act as supervisor/co-supervisor or member of any committee mentioned in this Ordinance.